I don’t know about you but I sure am ready for Spring. I recently received a pizza box of goodies from Love is in the Details and I couldn’t wait to dive in. 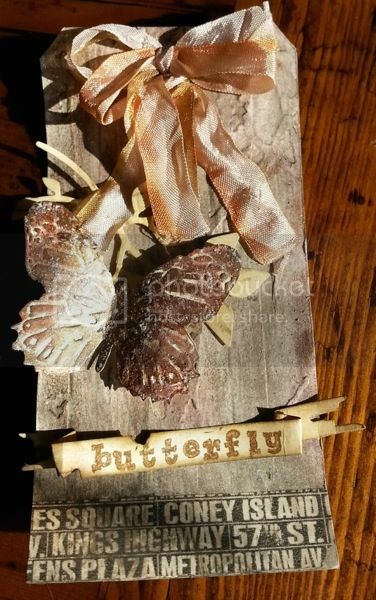 I received the beautiful Tim Holtz butterfly dies and embossing folders. I knew I had to use them as I am feeling so “springy” since I got back from our trip. Firstly, I die cut a tag, a butterfly, a tattered banner and some foliage. 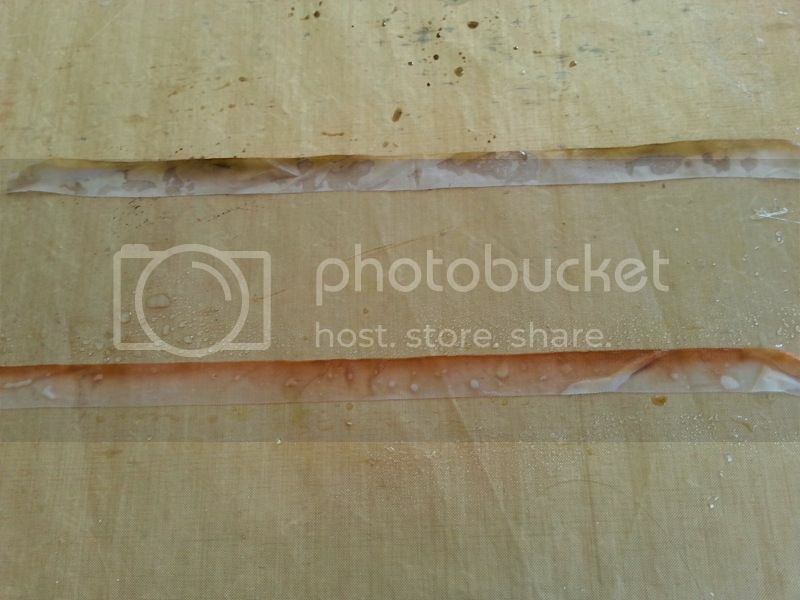 I ran the tag through the trees embossing folder and added some tissue tape to the bottom. I layered on a few different distress paints on the tag and when it was dry I rubbed on some Inka Gold colours. The photo doesn’t do the tag justice. The Inka Gold adds a beautiful subtle shimmer as the light hits it. Time to turn my sights to the butterfly. 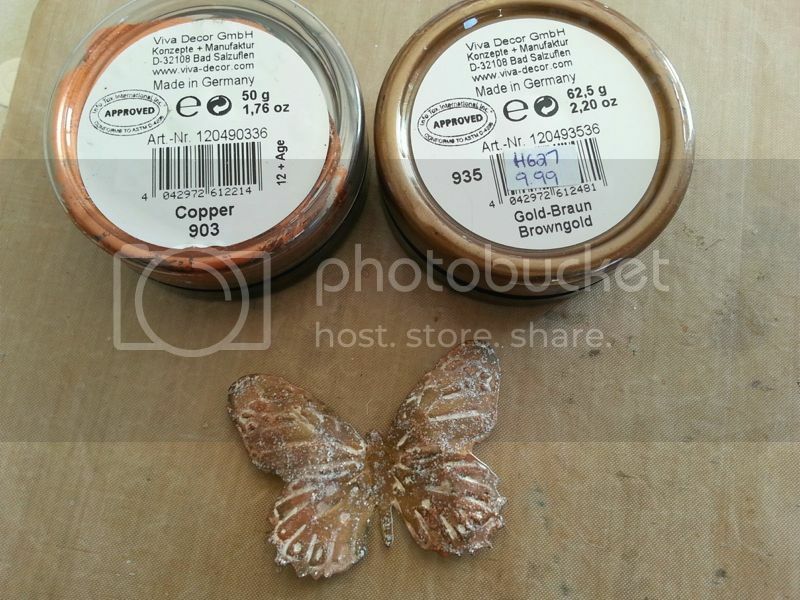 I rubbed the embossed butterfly with gold brown Inka Gold and then distressed the edges in places with distress ink. 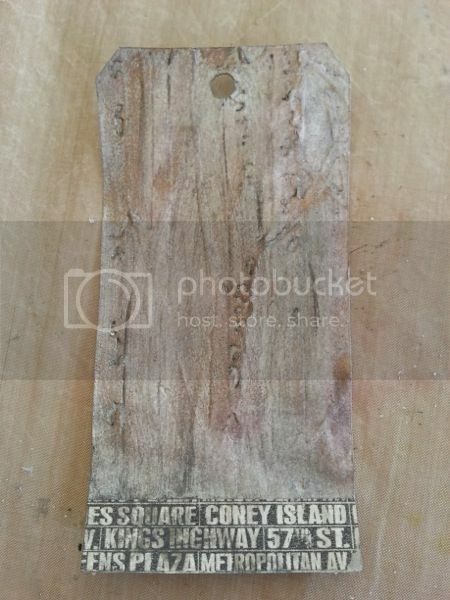 I covered the whole thing in picket fence distress stickles. When it was dry, I rubbed some copper Inka Gold on in places. I slightly rolled the wings to give the butterfly a little dimension when it would be on the tag. 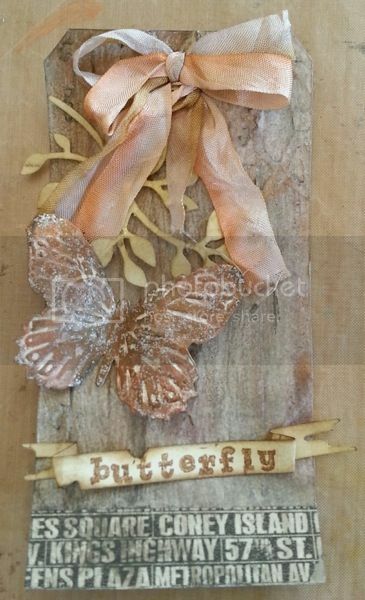 I attached some foliage to the tag and added the butterfly. I like to use a glue gun when attaching most things to my tags so that I know they aren’t going to fall off. One word of advice though…. make sure the spot is exactly where you want it because there is no moving it once it’s glued down. I added the banner with the word butterfly stamped on it. 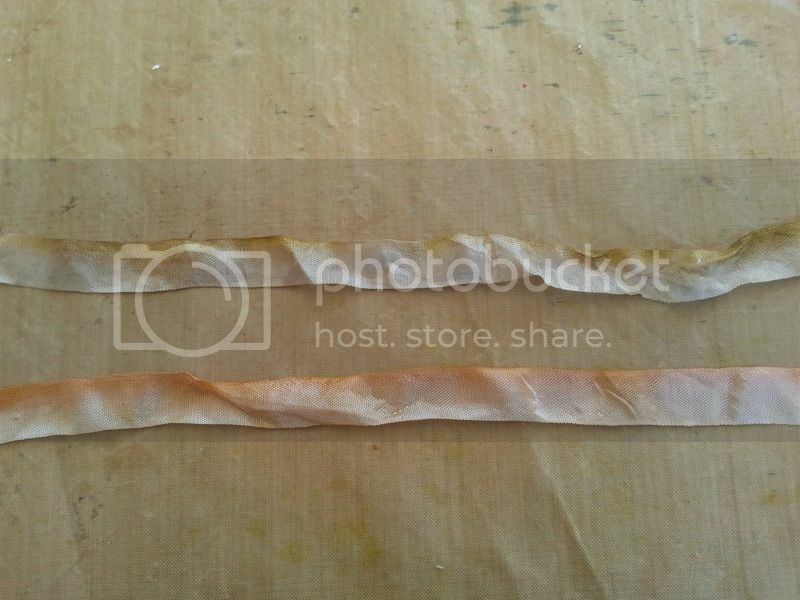 I decided to try my hand at making ombre ribbon. Trust me when I tell you it is so easy. I promise you will be running for your distress markers to try it out! Start by taking your ribbon. Tim Holtz crinkle ribbon works great for this as does plain white seam binding. 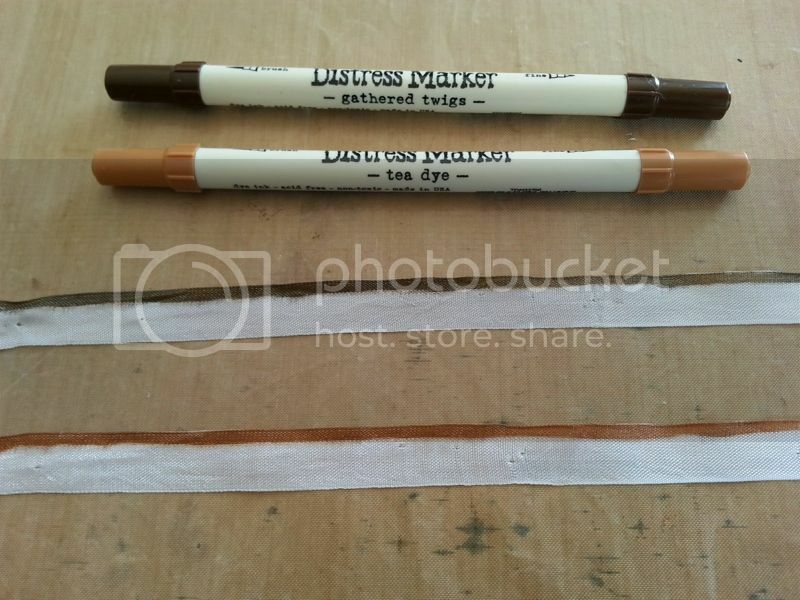 Draw a line of colour using a distress marker along one edge of the ribbon. Feel free to play with how wide you make your line of colour as well as the intensity. (You can go over your line a time or two to add intensity) Spritz with water and watch the magic happen. I dried mine with a heat gun and this is my final product. I tied it into a bow and attached it to my tag with the glue gun. I tried to take a photo to show the hints of glitter from the tag. Amazing what different light does for the same tag. I bet you will never look at distress markers the same way anymore, I know I won’t be! …. now, don’t mind me, I am going to go sit in the sun and dream of spring.